In this recipe we are looking for a heavy cream that contains at least 30% butterfat, ideally 40% would be best, but sometimes we have to take what we can purchase. The cream should be cold out of the refrigerator to whip best. 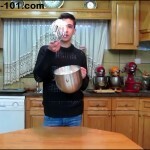 Some people claim it is a good idea to chill the bowl and the whisk prior to whipping. Can you whip this by hand? Yes you can, you need a balloon whisk and a deep bowl, ideally a copper bowl. And a lot of arm muscle. 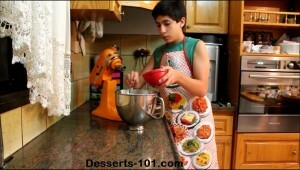 Place the whipping cream in the mixer bowl and whisk starting on low speed and increasing the speed. Adding heavy cream to mixing bowl. Whipping heaving cream on medium speed on stand mixer. Once you start getting soft peaks, slowly add in your sugar (if you are using any) and continue to whip until firm peaks. Soft peaks, time to add the stabilizer. 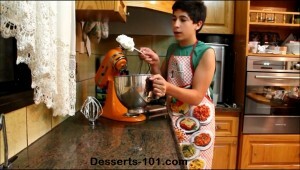 Adding gelatin mixture to soft peak whipped cream, then back to stand mixer to whip it in. Whip until firm peaks and you are ready to use. Items with whipped cream must be stored in the refrigerator since they are extremely perishable. NOTE: Do not over whip the whipped cream or you will end up creating butter. Finished Stabilized Whipped Cream, notice the stiff peaks. 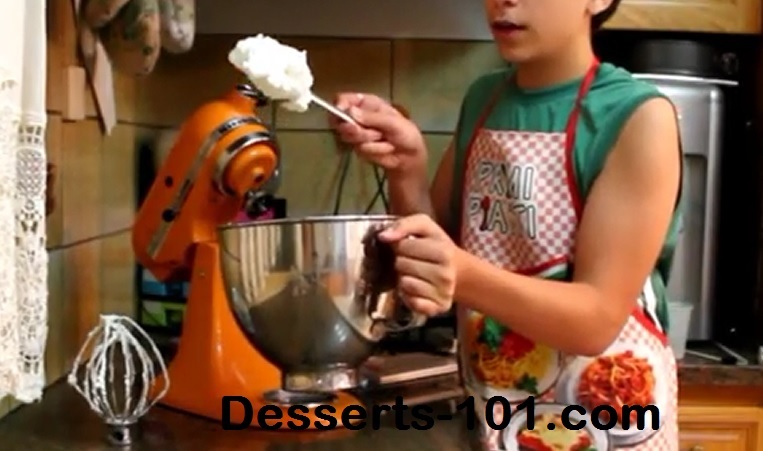 In this recipe, I show you how to make a Stabilized Whipped Cream which can be used to ice cakes and cupcakes and as a topping for other desserts. Place the water in a microwave safe bowl and sprinkle the gelatin powder on top. Allow this mixture to bloom for 5 minutes. The gelatin granules will swell up and absorb the water. 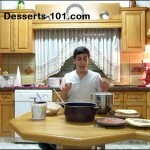 Heat the mixture in the microwave in 10 second intervals. Stir well. Once the mixture is a liquid, you are done heating. The gelatin mixture should not boil. Place the heavy cream in the stand mixer bowl and start whipping with the wire whisk on medium speed for about 3 minutes If you are adding powdered sugar, slowly add it in while you are whisking. You should have soft peaks now. Add the gelatin mixture to the whipped cream and continue to whisk on medium until still peaks form. Do not over whip or you could end up with butter. This item is perishable and items decorated with whipped cream must be kept refrigerated until serving time. Please note the the stabilized whipped cream may start breaking down in a day or two, but you should get a good 3 or 4 days in the refrigerator. It is best served the day it is made. For a chocolate variation - add ¼ to ½ cup of melted cooled chocolate to the recipe.